With an incarcerated father and a mother in rehab Emily is doing her best to keep her family together. But at seventeen years-of-age, with three younger siblings to look after, she’s ill equipped. Never mind the fact that she’s hearing voices . . . and then there are the strange markings which keep appearing on her arm. Finding solace in the fantasy realm she created as a child, Emily slips further and further from her world as a way of escaping the realities that threaten to consume her. 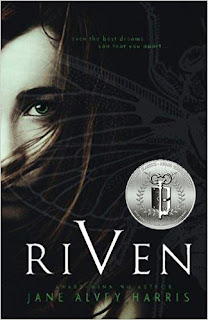 Author Jane Alvey Harris’ Riven, book 1 in the My Myth Trilogy is a psychological thriller. This suspenseful work of fantasy fiction with powerful undertones will speak to many readers on a much deeper level. With a message of empowerment that resonates with survival, healing and above all, courage, Riven has earned the Literary Classics Seal of Approval.